Forest Garden We are developing a Forest garden on the farm - exploring its potential. It has become a wonderful place for wildlife with a constant buss of bees and other insects. The fruit is productive and we are working on the ground cover. Come and help on a volunteer weekend; go to contact and I will send you details. Roeburnscar Holiday Cottage We have been upgrading Roeburnscar, an uninsulated wooden bungalow heated by oil, to be as green as possible. This has involved rebuilding to accommodate full warmcell insulation and adding wood gasifier and solar thermal hot water. Beautiful wooden doors, comfortable and spacious for up to 9 people. Lancashire Apple Project In order to protect the diversity and heritage apple varieties that have been grown in Lancashire we were funded by Lancashire County Council and helped by experts Phil Rainford and Hilary Wilson. We now have a collection of over 200 varieties growing. Over the years we can see how they cope with our damp conditions. 2018 apple crop has nearly all gone into our new venture - making a Craft Cider vinegar. The final exotic product is expected to be ready 2020/2021. Currently there is close to 1000litres making its way to cider with delightful gurgles from the airlocks. Living Water Hydro We are working with engineer Ben Tyers to develop a water friendly hydro electric system that is inspired by the early work of Victor Schauberger. (Project Not active at the moment). River Roeburn Restoration The River Roeburn catchment has eroded badly and no longer holds water. The disruptive flash flooding has destroyed the basic water cycle and a healthy ecology. It is becoming a wet desert. We are developing plans to restore the Roeburn catchment so that it will retain water in the landscape, regulate the river flow, replenish deep spring water and provide abundant habitat for wildlife. See Film below. Exciting news the Lune Rivers Trust has been successful in obtaining a Water Environment Grant to help save Roeburndale Woods from Erosion. 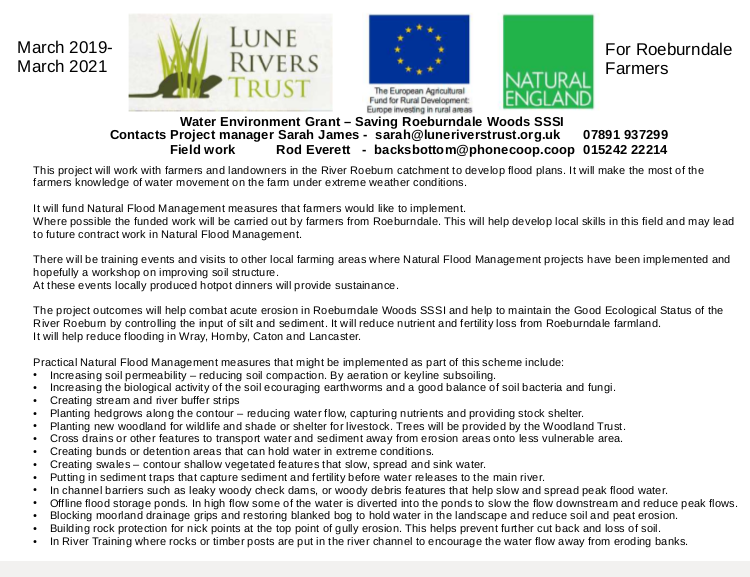 I am running this project and will be working with farmers up the valley on Natural Flood Management and setting Backsbottom Farm up as a flood demonstration site. This explores the use of in Stream training to alter water flow and prevent erosion using groins, vanes funnels and check dams.